A wedding should be a spectacular event. After all, it is a once-in-a-lifetime opportunity and, for some, the only moment to be the prince and princess of their own fairytale. White silk, taffeta, chiffon and lace fill the minds of eager brides, while satin and tulle pop into mind later. But despite the classic materials of wedding gowns and wedding gown designs that have been used so frequently, there are certain non-conformist and creative ideas which may surprise and inspire you. Pearls of all shapes and sizes aren’t just reserved for jewelry pieces. They can be incorporated in virtually any type of garment and accessory as long as their use is tasteful and unique. That being said, here are 10 jaw-dropping pearl embellished wedding gowns to sweep any bride-to-be off her feet. This one of a kind creation designed by Galia Lahav is the epitome of delicate beauty. The subtle lace embellishments complement the A-line gown perfectly, while the long, multi-layered pearl strands add a surprise factor while maintaining the elegance and sophistication of the ensemble. Be sure to wear your hair up if choosing a similar design and pair the gown with teardrop pearl earrings. This wedding dress can be described as the trifecta of good taste: modest, well-fitting and chic. The sweetheart neckline emphasizes the bride’s long neckline while the sheer, pearl-embellished sleeves make such a gown perfect for traditional settings or strict churches. Sweetheart necklines are a feminine and elegant choice for most brides and regardless of whether you choose a strapless dress or decide to cover your shoulders, there are options for everyone. This lace and pearl gown designed by Inbal Dror represents the perfect marriage between a fabric that may be heavy if used incorrectly and elements which may overwhelm the natural beauty of the gown’s wearer. Luckily, with such a design, the fabulous dress only complements the bride. Non-traditional brides are always on the lookout for the next big thing. 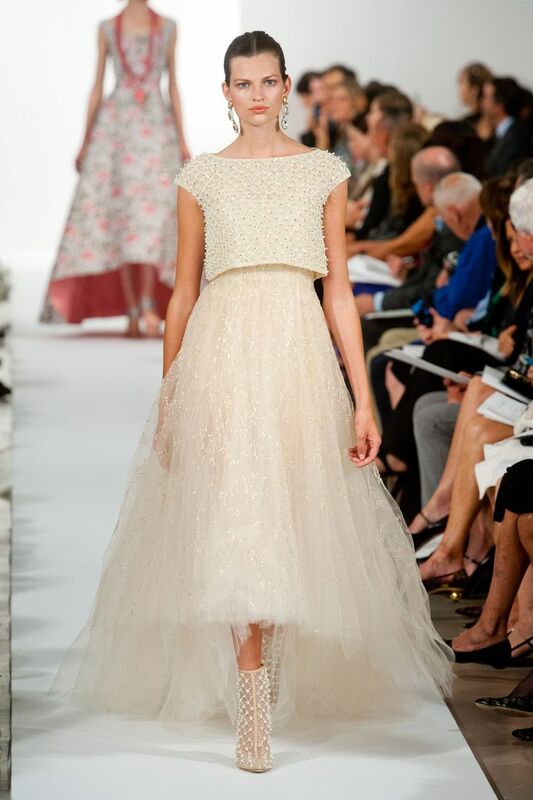 Oscar De La Renta’s two piece design may just be what they are looking for. The delicate, symmetric pearl-work mixed with the tulle asymmetric skirt makes for a one-of-a-kind appearance that your guests will never forget. This vintage wedding gown is most certainly a statement piece, not just because you don’t have to worry about jewelry, but also because of the richness of the satin. The strands of pearls of unequal sizes resemble a collar pearl necklace, going up the neck. 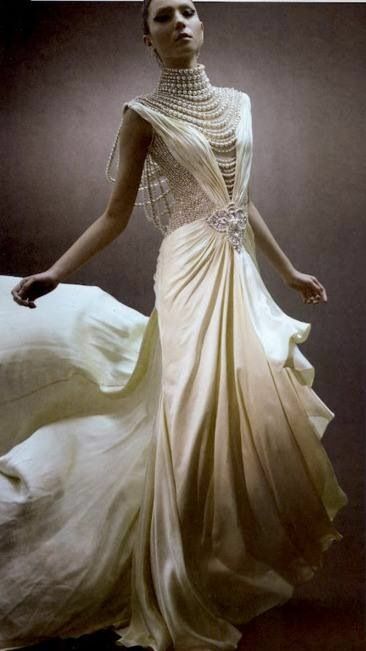 The back of the dress, however, may be the most interesting part of all, as free-hanging pearl strands of different lengths give the gown a particular je ne sais quoi. The intricacies and detail of this wedding gown are absolutely breathtaking. From top to bottom, there isn’t a single detail that hasn’t been perfectly placed and while the collar seems to be awe-inspiring, there is no portion of this dress that isn’t flawless. Instead of wearing a veil, many brides choose sheer capes, which are excellent choices, especially when beaded with tiny, lustrous pearls. In the case of this particular silk gown, the exquisite cape takes center stage, and with good reason. Are you in love with pearls but simply can’t commit? That’s not a problem. You can always choose a pearl-beaded jacket to complement your beautiful wedding gown. It’s a 2 in 1 deal, as you can always take the jacket off when things get heated on the dance floor. Just as certain brides cling to tradition, all-white and no beading, there are others who wish their wedding gowns to reflect other sides of their personalities. Short dresses can be an excellent choice for a wedding, especially when embellished with pearls, like the one in the above picture. This A-line stunner, of a seemingly simple design, is far from simple. Tiny teardrop pearl embellishments were used from top to bottom in order to create a cohesive and unique design. Few brides would dare say no to a creation of such beauty.